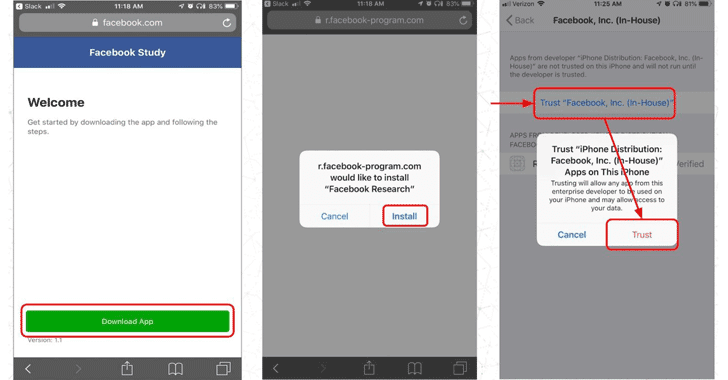 According to the Facebook Research’s terms of service, installing the app gives the company permission to collect information about other mobile apps on a participant's smartphone as well as how and when those apps are used. "This means you are letting our client collect information such as which apps are on your phone, how and when you use them, data about your activities and content within those apps, as well as how other people interact with you or your content within those apps," the terms read. "You're also letting our client collect information about your internet browsing activity (including the websites you visit and data is exchanged between your device and those websites) and your use of other online services. There're some instances when our client will collect this information even where the app uses encryption, or from within secure browser sessions." Though Facebook's spokesperson claimed that the app was in line with Apple's Enterprise Certificate program, but since Apple requires developers to only use this certificate system for distributing internal corporate apps to their own employees, "recruiting testers and paying them a monthly fee appears to violate the spirit of that rule," the report reads. Apple is "aware" of the issue, but it is unclear if the iPhone maker might ban Facebook from using its Enterprise Developer Certificates or not.